As we all know, fresh and wonderful coffee makes any morning better, but the ability to brew a fine cup, in a place where it might seem tough to do it, is a life skill that will pay you back again and again. Think of any time and place, then add a delicious cup of coffee, and instantly things just got better. A superb cup at a remote campsite raises the appreciation level of just being, and makes a memorable morning. Below, we’re going to give you a few ideas of what we like for our coffee road gear. Usually we keep all these components in our “coffee go bag” because it’s easy to do, and you never know what the road/trail will present. All coffee brewing can be broken down into three components: heating water, grinding coffee, and brewing. So, we’ll start with heating the water. Your water should be just off-boil when you present it to your ground coffee, and how you get it there really doesn’t matter. If you have a microwave in your hotel room, you’re set. In any case, if you have access to an electrical outlet, it pays to toss an immersion water heater in your pack, similar to the one below, for about $14. You might want to consider buying two of these because if you ever plug one in without first putting the coil into water, it goes fzzzzt! and dies. And that’s your only rule in using one. Otherwise, just put it in your cup of water, plug it in and wait for your water to boil. Trailside, your options for heating water are endless, and depend on your own camping style. 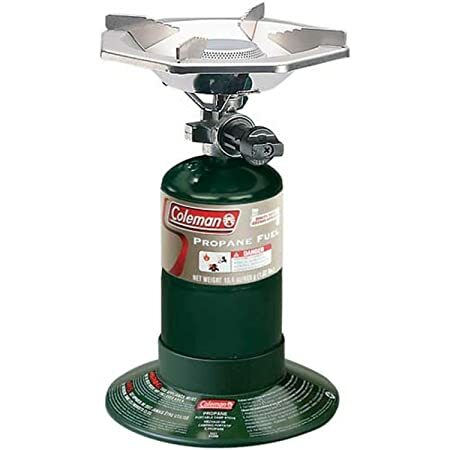 Our ultra-light backpacking days are behind us, so we just pack one of these little propane stoves in the car, for about $28. It sits on a table just fine, has a stable, controllable burner, and uses little propane bottles available anywhere. Even if you are hotel traveling, with one of these in your trunk you can pull off on a side road or park, and brew some outstanding coffee whenever you want. You can even cook breakfast on this little burner if you wanted to. For brewing, we always include the tried and true “el cheapo” #4 pour-over cup, for under $7. With these little jewels, you can make two cups of coffee at the same time, and whether you’re doing a two cup power-up for yourself, or making a cup for a friend, this is perhaps the best, cheapest way to make wonderful coffee that there is (for more on pour-over brewing check over here). Make sure you have some #4 filters, similar to these, at about $4 for a hundred. The other brewing option that we like is the aeropress, which can give you an “espresso like” cup, and gives you complete control over steeping time. It will make some really fine coffee. At about $32, this is a fantastic little coffee brewer, and there are tons of You Tube videos and blogs on how to use one. It’s easily cleanable, packs in a light and tight package, and produces little waste. So, adding up the numbers we get a very respectable travel coffee kit for around $40, or up to about $80 if you need to buy the stove, and want to go the aeropress route. For campers that already have their stove, the most basic level of simplicity is the grinder, the cone and some filters at about $30. By the way, there’s nothing that says you can’t use these same set-ups at home. Fresh roasted, fresh ground, freshly brewed coffee is never wrong.